Well, I’ll say this for a start: “Vengeance On Varos” is better than “The Twin Dilemma.” Which is almost the faintest praise you can give a Doctor Who serial, considering how embarrassingly bad “Twin Dilemma” is. (It’s also more entertaining than stabbing yourself in the hand with a fork.) “Vengeance On Varos” has the dubious merit of being the best show from season 22. That doesn’t make it a good show, and at one point in my notes, I stopped trying to keep up with the plot points and just wrote in all caps, “GRIM SLOG.” But it does succeed better than anything else from this period of the show in making use of the otherwise awful, awful, awful concept of the Sixth Doctor by sticking him in a world suffused in the spirit of early-1980s punk nihilism, offering up a dark, cynical parody of the whole concept of Doctor Who itself. One thing that’s been endlessly fascinating to me in going back through all these vintage Doctor Whos is the way the program constantly changed to reflect the popular culture around it, and especially the popular trends in sci-fi. If that meant Doctor Who was almost always more of a trend-chaser than trendsetter, it’s also a major reason it lasted for 26 years. And that goes a long way toward explaining the otherwise mystifying decision to make the Sixth Doctor such a repellent character and his adventures so dank, grim, and depressing. Because look at what else was going on: Terry Gilliam’s brilliant but horrifyingly bleak Kafkaesque satire Brazil was just about to be released; his previous movie was the comparatively lighthearted Time Bandits, which ended (spoiler for a 31-year-old story) with the boy hero’s parents killed just so Gilliam could close with a nasty, shocking, macabre joke. And in Repo Man, 2000 AD, Heavy Metal, The Running Man, The Terminator, Max Headroom, and the grimy spaceship setting of Alien—seemingly everywhere in science fiction except in Steven Spielberg movies—life was harsh, cities were falling apart and burning, and the message was that the future was going to be worse than what we had now. As the story begins, the Doctor is having a terrible week: As Peri catalogs it, “you’ve caused three electrical fires, a total power failure, and a near collision with a storm of asteroids. Not only that, you’ve twice managed to get yourself lost in the TARDIS corridors, wiped the memory of the flight computer and jettisoned three-quarters of the storage hold. You even managed to burn dinner last night.” And he’s managed to leave the TARDIS stranded and powerless by neglecting to replenish its supply of Zeiton-7, a McGuffin designed to give him a reason to go to Varos, since that’s the only place it can be found. But before Peri prods him into thinking of Varos, he sinks deeply into despondent self-pity, ready to literally curl up and die, moaning to Peri that at least she’ll only have to die once, since he’ll just keep regenerating every time he starves to death. Now, maybe I’m not cutting this scene enough slack since it’s obviously meant to be comic, but it’s a pretty bleak and acidic joke to make such a deliberately ugly inversion of what the Doctor had been in previous years. He is less over-the-top obnoxious here than he was in “The Twin Dilemma,” but it’s an improvement only to the extent that he’s not actively trying to kill Peri, but merely ready to watch her die. 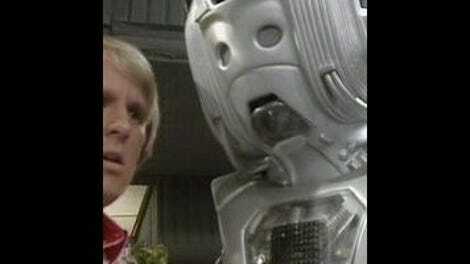 True, Peri soon goads him into action, but even when they get to Varos, he is pretty reactive and passive. Peri doesn’t fare much better, spending much of the story out of her depth and struggling just to stay alive. She has trouble explaining to her interrogators why she and the Doctor are on Varos because she doesn’t entirely understand it herself. Which I have a certain sympathy with, because it’s what would probably also happen to me if I was stranded on a place like Varos. In some ways, Peri’s constant vulnerability throughout her time on Doctor Who is an interesting dose of realism into how an ordinary human like her—or you, or me—would cope with the myriad dangers that the Doctor runs into every time he steps out of the TARDIS. But that still doesn’t make it any more fun to watch her. She’s constantly sullen, shrill, and bad-tempered, and not somebody you’d want to be stuck traveling with. And she’s passive. The most notable thing about Peri in “Varos” is that she’s almost turned into a bird, and that’s something that happens to her. Compare that with Doctor Who’s many great female characters—Zoe Heriot, Jo Grant, Sarah Jane Smith, Leela, or Romana, for starters, all of whom had plenty of moments where they were more than just the girl tied to the railroad tracks. Given what we’re presented with for main characters, a villain would have to be radioactively repellent to seem worse than them—and unfortunately, that’s what we get with Sil, the moist brown slug from outer space. Certainly there’s a grand tradition from Doctor Who villains to be scenery-chewing and over-the-top, which has sometimes worked very well—take Solon in “Brain Of Morbius,” or Roger Delgado as The Master during the Third Doctor era. But that kind of overacting more often than not is just poisonous to a story, and Sil is just, ugh. I mean, ugh. His belligerence and leering, greedy, toad-like personality is clearly meant as a parody of corporate capitalism, but it’s so obvious and nuance-free that it’s not enjoyable or particularly perspicacious. Nabil Shaban goes for all-out obnoxiousness, nothing but screaming, petulant mugging and disgusting tongue-wagging. Still, maybe that was the only good choice for portraying a character who was apparently designed on purpose to look and behave like an animated, oversize lump of human excrement. I guess they were shooting for a satiric effect akin to South Park’s Mr. Hankey, but instead of clever Sil just winds up revolting and dumb. And yet the character was apparently popular enough to be brought back again the following season for “Mindwarp,” the second part of the season-long “Trial Of A Time Lord” storyline. Go figure. The dystopian society of Varos is far from the first one the Doctor’s encountered, but what’s different about it is the attitude the story has about it that not only is Varosian society fundamentally broken and corrupt, but that there isn’t really anything that can be done to improve it to any significant degree, at least by any of the characters we’re presented with, and that any happy ending may as well have come about through random chance as the actions of the people on screen. The Doctor Who of “Varos” doesn’t believe in the kind of unalloyed heroism represented by Doctors One through Five—instead, the heroes it gives us are either corrupt (the governor), incompetent (the Doctor), or irrelevant (the rebels). The anticorporate rebels survive, but they don’t take over. Instead, the worst elements of the government are nullified or killed, but the governor stays in power. And the governor is also the closest thing to a hero we’re going to get here, as he tries to fight both his own bureaucracy’s endemic violence and corruption and outwit Sil in a trade agreement for the Zeiton ore. He’s really the only dramatically compelling character, and it’s too bad that he doesn’t actually defeat Sil himself so much as he has a TKO handed to him by the scriptwriter when Sil’s hoped-for invasion force turns out to be instead orders from home office to knuckle under. Note also how little The Doctor has to do with resolving the story, which ends well not because of anything brilliant or proactive he does, really, but because he was lucky enough that nothing worse happens. (Though he still takes credit anyway.) Sil turns out to be something like the Sixth Doctor’s Moriarty—his perfect dramatic opposite, who can match him and even best him only in boorishness and blustering incompetence, and who fails not so much because anyone actually defeats him or outwits him, but because the writers throw in a deus ex machina. It’s really no wonder, looking at season 22 with 2012’s hindsight, that this was all a terrible idea that would wind up nearly destroying the series. 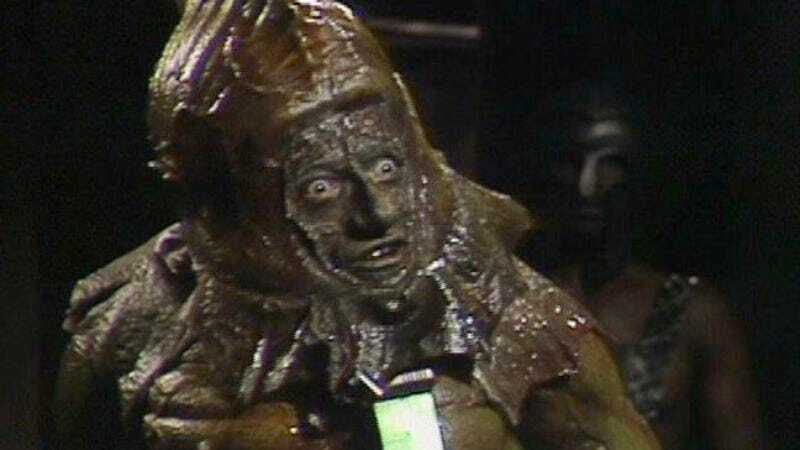 “Varos” gives us a Doctor who is a foolish, abrasive clown, and almost totally lacking in the charm and larger-than-life qualities that made his earlier incarnations tick. Indeed, those very qualities are savagely parodied by every aspect of his character from the bipolar yaws between arrogance and pathetic whining to the fact that his candy-colored costume only makes sense as a caustic satire on the Doctor’s own eccentricity. And that’s not automatically a bad way to go—a bumbling Doctor could be comedy gold if written the right way. I’m just not sure what producer John Nathan-Turner and script editor Eric Saward thought they were getting out of destroying their own show by making its central character such an unpleasant person to be around, or by making the show as a whole so grim, bleak, and ugly. The one moment of grace and beauty in “Varos” is the bit of monk-chant music that plays before the hanging scene. In fact, it’s disheartening that the show is this violent and cynical considering that its best producer, Philip Hinchcliffe, had been hounded off the show just a few years before because of complaints about the tame-in-comparison violence on Who under Hinchcliffe’s watch. The cannibal regressives in “Varos” make the stuff Mary Whitehouse complained about seem like The Waltons. Upcoming schedule: Two Sundays from now, the Seventh Doctor and Ace meet underwater Viking vampires and an immortal chess-playing evil god during World War II in “The Curse of Fenric.” After that, we’ll begin the cycle again with the First Doctor in “The Time Meddler,” the Second in “The Seeds of Death,” and the Third in “The Curse of Peladon.” Then we’ll hit the Davros-era Dalek tales in order, starting with “Genesis Of The Daleks,” and on through “Destiny,” “Resurrection,” “Revelation,” and “Remembrance”—interspersed with some TBA non-Dalek material as well.